Python is an easy to read language, with a large standard library and easily extensible interpreter. Python also has the ability to scale complex applications, making it a great choice for a variety of application types. If you would like to include Python in Eclipse, CodeMix is a great solution. CodeMix is an Eclipse plugin that lets you add Code-compatible extensions directly into Eclipse. With CodeMix, you can add the popular VS Code Python extension by Microsoft to have first-class support for coding Python in Eclipse. CodeMix is compatible with Eclipse-based IDEs and tools—like MyEclipse, Spring Tools Suite, and JBoss Tools—so you can continue working in the environment you are accustomed to, while developing in Python. Take a look at some of the exciting features CodeMix offers the Python developer and then check out the Getting Started guide that includes everything you need to know before starting your Python development with CodeMix. IntelliSense includes intelligent code completion, documentation as you type, and more! Snippets quickly produce commonly used bits of code; simply install a python snippet extension for this nice timesaver. If you prefer using the keyboard, the Python extension provides a number of commands that you can use to do everything from refactoring to formatting, or even running your current Python file and executing unit tests. A linter will analyze your code, looking not only for syntax issues, but also potential bugs, or just poorly written code. With CodeMix you can choose between multiple Python linters, such as Pylint, Pep8, Flake8, etc. The CodeMix Extension Manager makes it easy to get everything you need for superior Python programming. From the Extension Manager, simply browse for the Python pack. Go to File>New>Project>CodeMix and select Python Project to create a new Python template project. The wizard installs any missing Python extensions and prompts you to install missing Python plugins. 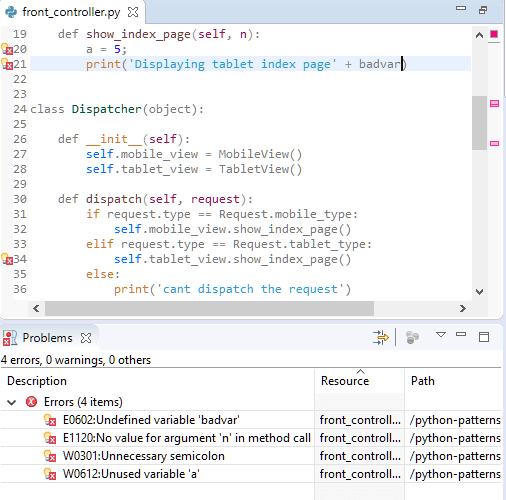 Debugging everything Python is possible, from simple console based applications, to web apps built with Django or Flex, or even PySpark applications for big data analysis. Python Extended for code completion with arguments. Django Template & Django Snippets for web development with Django. Jupyter for data science, and scientific computing. Play this quick video to learn more about Python coding with CodeMix. CodeMix is free to try for 45 days—download it now!